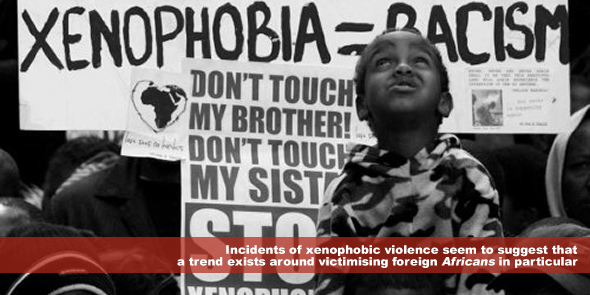 Incidents of xenophobic violence seem to suggest that a trend exists around victimising foreign Africans in particular. Ironically, the latest upsurge in xenophobic attacks occurred as our leaders were converging in Addis Ababa for the African Union’s 50th Anniversary to celebrate “African Unity”. Clearly, South Africa has a long road to walk in this regard. We seem to ignore the shared commonality with other Africans, as well as being forgetful about the important role that African leaders and states played in forging the country that we are today. Figures like President Jacob Zuma and former President Thabo Mbeki took refuge in our neighbouring countries during the apartheid era, yet they fail to speak out about the obligation on all South Africans to support those who flee their homes because of intolerable situations. Allegations are regularly made that the influx of foreign nationals directly affects unemployment and poverty in South Africa, as citizens now have to share the limited number of opportunities with immigrants and refugees. There is a significant lack of evidence and research to support these allegations, and this unfortunately negatively impacts both ways. Those standing for the allegations argue that it is trite enough that no evidence is necessary, while those opposing it (usually politicians and officials queried about their neglected obligations) dismiss the allegations out of hand. It is very clear that we can no longer ignore the problem, and detailed evidence-based statistics are necessary. Only through understanding the problem in full, can we begin to address it. Misguided anger and revenge will not address any issues around poverty, unemployment and crime. Through xenophobic violence we are not only creating a hostile environment for all people, but we are also stigmatising all foreign nationals – even those residing in the country on legal terms. Remarks that South Africans are growing desensitised towards xenophobia and the violence that it fuels have attracted much attention. The truth, however, is that we have already passed the point of “becoming desensitised”. Media reports and video footage clearly indicates that South Africans from all walks of life not only encourage xenophobia, but no longer hesitate to act on these feelings. We are raising the next generation of South Africans by setting an example of hostility and apathy. The fact that we are dealing with real people, real lives, seems to escape us completely. It is crucial that we start publicly debating this issue, and deal with it decisively. Unfortunately none of this is possible without taking the first step – to admit that we, as South Africans, have some introspection to do. Josua Loots works as a project manager at the Centre for Human Rights, Faculty of Law, University of Pretoria. He holds an LLB and LLM in Human Rights and Democratisation in Africa from the same institution. Josua grew up in the Limpopo province of South Africa, and his interests include international law, business human rights and conflict resolution. xenophobia mirrors the ignorance and backwardness/timidity of the people that perpetrate it. Thanks Mr. Loots for the weighty article on xenophobia in South Africa. Xenophobia is a reflection of ungratefulness and forgetfulness. Xenophobia is racism. We should remember the African pillar of brotherhood. We are family and when we disagree, we should not hate or use violence. Storms are part of life and I still have hope that South Africa will rise above the raging storm of xenophobia. Providing jobs for immigrants who are graduates and professionals would discourage them fro venturing into crime. We are all Africans, they too should be treated in a polite manner regardless of their nationality. In xenophobic outbursts such as this,who stands to lose? It’s the xenophobic that surely stands to lose and will lose big time.